The beef isn't the only thing at McDonald's that is hot and fresh these days. So is Mickey D's stock. It hit a fresh all-time high Wednesday as investors continue to cheer the company's comeback under CEO Steve Easterbrook. Shares of McDonald's (MCD) are now up nearly 27% this year. That makes it the second-best performer in the Dow, trailing only Boeing (BA) and coming in a hair better than Apple (AAPL). McDonald's has been thriving since Easterbrook took over more than two years ago. 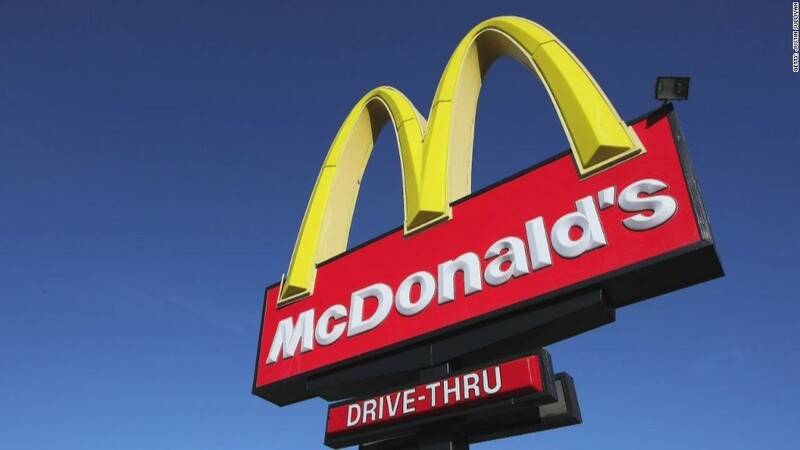 Sales have sizzled as the company unveiled new menu options, including all-day breakfast and different sizes of the iconic Big Mac, that have become hits. McDonald's has promoted healthier salads as well and is starting to use more fresh, as opposed to frozen, beef patties for its burgers. And McDonald's has also been embracing technology in order to live up to Easterbrook's oft-repeated goal of making McDonald's a "modern and progressive burger company." But can McDonald's keep the momentum going? Wall Street thinks so. Several analysts have raised their ratings and price targets on the company since McDonald's reported strong results in late April. Cowen & Co.'s Andrew Charles just upgraded McDonald's to a buy on Monday and lifted his price target to $180 a share. That's 17% higher than McDonald's current price and is the highest price target on Wall Street. Still, it's worth noting McDonald's isn't the only fast food chain that is thriving. Shares of Restaurant Brands (QSR) -- the company that owns Burger King and coffee chain Tim Hortons and also recently bought Popeyes Louisiana Kitchen -- are up 30% this year. Burger King has enjoyed a big turnaround too, thanks in part to wacky food fusion items it has created -- such as Mac n' Cheetos, Chicken Fries and its latest crazy culinary concoction: a Lucky Charms milkshake that includes bits of the famous cereal in it. Yum Brands (YUM), the owner of KFC, Taco Bell and Pizza Hut, has also been on a tear lately. Its stock is up 17% this year and its newly public spinoff for its Yum China (YUMC) unit has soared more than 50%. And the success of McDonald's and its key rivals comes as the so-called fast casual restaurant industry is experiencing some growing pains. Chipotle's (CMG) sales have rebounded from its E. coli woes, but the stock tanked earlier this week after warning that its profits will be hurt by higher marketing expenses it has incurred to try and get skittish consumers back in its restaurants. Another fast casual leader, Panera (PNRA), agreed to sell itself earlier this year to Krispy Kreme owner JAB. So the broader restaurant industry may be in flux. But McDonald's is pretty stable -- and investors, like the Justin Timberlake jingle says, are still lovin' it.